I've had a nice, quiet, tired day. My Saturdays have gotten into a pattern - I sleep late and take naps most of the day. That's fibromite life! 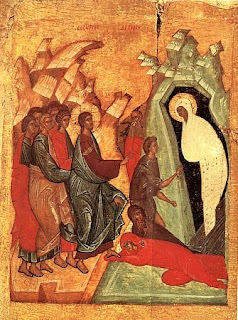 By raising Lazarus from the dead before Your Passion, you confirmed the universal Resurrection, O Christ God. And this makes me happy, because I know you're okay. You're better than okay. And there's hope even for me. And all of this is true because Christ is victorious over death. He raised Lazarus right before entering Jerusalem the last time, so the disciples wouldn't despair when the crucifixion came. And Lazarus Saturday and Palm Sunday come the weekend before the rigors and grief of Holy Week, so that we go into Holy Week with a fresh awareness that the Resurrection is around the corner. All of this keeps us ordinary folks from despair during our own times of grief. As we'll sing in a week, Christ is risen from the dead, trampling down death by death, and upon those in the tombs bestowing life. It looks from here like you've died, but in reality it's life that you've entered. May God grant that I persevere and am faithful to the end, and also inherit eternal life!